NOW…let’s get into this guide of sorts about Rams vs. Knights and Columbia, South Carolina because Third Month Wack-A-Doo is upon the dancing festivities of college basketball! This will be VCU’s 17th NCAA Tournament appearance in school history and the Rams’ eighth selection as an at-large bid. While Brooklyn didn’t treat the Black & Gold well with an early Quarterfinal exit from the Atlantic 10 tournament, VCU is…well…I’ll let Coach Rhoades explain. To say that the Black & Gold is mad would be an understatement. VCU is downright PISSED that they didn’t accomplish their goal of winning the A-10 Tournament. That energy turned in motion with action in the gym after coming back to RVA in preparation for Friday’s first-round game. #2 will be in Columbia! Marcus Evans’ has a majority of the spotlight in preparation with a bone bruise injury in his left knee. Coach Rhoades stated that once they got back into town, Evans was further evaluated and working at the practice facility for hours. The expectation is that Marcus Evans will be available for Columbia however VCU is taking every precaution to get #2 in prime condition. Marcus Santos-Silva was primetime against Rhode Island and has Ram fans praying for an encore performance. Santos-Silva made the A-10 All-Tournament team after putting up a career-high performance of 26 points and 22 rebounds versus Rhody. That wicked smile of De’Riante Jenkins is glowing at the chance to play in his home state of South Carolina. A native of Eutawville, SC, Jenkins is really excited that his family can get the chance to see him play in March Madness in person. Central Florida has made the NCAA Tournament for the first time in 14 years. UCF turned a 19-13 finish last season into a 23-8 overall turnaround in 2018-19. The Golden Knights suffered a similar post-season fate by falling in the American Athletic Conference quarterfinal to Memphis. Leading the Golden Knights this season is redshirt Senior BJ Taylor out of Orlando. Taylor leads UCF in scoring (16.0 PPG) and has scored the most points for UCF on the year (496). When he’s not shooting, Taylor has a knack for assists and gets handy going after steals on defense. BJ made the AAC’s First Team All-Conference. Aubrey Dawkins missed the entire season due to injury and is back in a big way starting in all 31 games; Dawkins is one of UCF’s three-point threats shooting 39% from downtown. He’s also a physical rebounder alongside Tacko Fall. 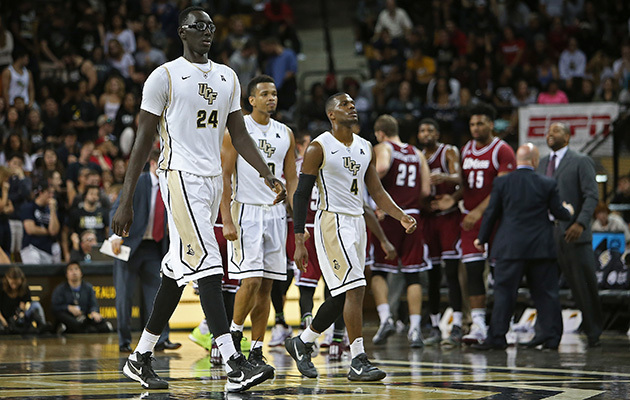 Speaking of the 7’6” Center from Senegal, Tacko Fall is more than just tall. Fall leads UCF in total rebounds (227) and blocks (77). He can literally dunk the ball without even jumping which is insanity. UCF has outscored its opponents by a +7.8 scoring margin over this season. Even with Dawkins and Fall inside, the Golden Knights only have a rebounding margin of +2.2. The first half has been key for UCF by outscoring their opponents 1041-882 in the first 20 minutes of play. Yeah! We beat Wichita State and UCF didn’t! Outside of “scheduling” advantages, VCU and UCF are nearly similar in certain statistics. HAVOC does have the advantage in steals with 8.0 SPG compared to UCF’s 5.7. VCU is the better free throw shooting team by nearly 5% (69% to 64%). One more advantage for the Rams is depth with that Ram Army; UCF has 7 players that have played in all 31 games including their starting five rotation. For VCU, 11 players have played 29 games or more this season. Colonial Life Arena is the home of college basketball for the University of South Carolina that fills up to an 18,000 capacity. The arena was open in 2002 and VCU is hopeful that it can turn into Siegel South thanks to Ram fans making the trip. There are some local watering holes around the Arena for Ram fans to fill up before and after the game. Thirsty Fellow Pizzeria and Pub has some good pizza and wings mixed with some craft brews. 1801 Grille has that Tennessee vibe mixed with good food and plenty of room for a watch party…or several. For the craft beer lover of the group, check out Cottontown Brew Lab or Columbia Craft Brewing Company. There are a few more local breweries a couple of miles further away from Colonial Life Arena which requires a few more hours if brewery hopping before games is your thing. This will be the first time that VCU and Central Florida will go to war in history. My main concern outside of the obvious in containing Tacko Fall is how VCU contains UCF from three. On paper, the Knights would prefer crashing the paint so obviously, this would be the game UCF goes bonkers from beyond the three. As VCU radio analyst Mike Litos tweeted: Santos-Silva vs. Tacko Fall? Gimmie. This matchup of two paint warriors could possible sellout a boxing card at MSG. Santos-Silva has a tough matchup ahead of him and is looking forward to the duel against Fall for rebounds and points. Team defense will need to be on lock and key sending help down low while also keeping UCF pressured on kick-out passes near the perimeter. Evans’ performance off of injury is the wildcard here. VCU’s leader is excited to have the chance to show off in the NCAA Tournament with VCU and his family watching in the stands. If that Evans is similar to that #2 of the season, then VCU’s chances of victory just skyrocketed. If not, then VCU will just have to use that Army of theirs towards finding a fitting response against the Knights. What’s a couple Knights to an Army? Expect that Ram Army to impact this game. I foresee Coach Rhoades switching players in and out to keep UCF on edge while wearing them down physically. Three-point shooting will probably be on a high production level while VCU works to establishing a paint game against Fall and company. The 40 minutes will be an emotional rollercoaster featuring a #8 versus #9 with the higher seed claiming a close victory. Since 1985, the No. 8 and No. 9 seeds have split their 136 meetings in the NCAA Tournament. The Hunt Continues for VCU heading into Columbia! Siegel South in the Works! See Y’all in Columbia! A Battle of the Rams that didn't go the Black & Gold way.